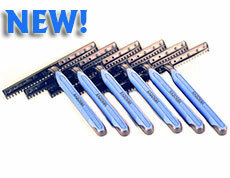 NEW GREATEST (G.O.A.T) EXTRA WIDE DISPOSABLE RAZOR is NOW AVAILABLE. Attaches to your Razorba Shaver for a Fast and Comfortable shave. The World's #1 Selling, Award Winning, Shaving Product for Back Hair. For the guy on a budget the Razorba is a really great option." Let's face it, back hair on a man isn't attractive. It's the equivalent of a woman with hairy legs. But for men, there is no easy way to rid yourself of back hair, until now. 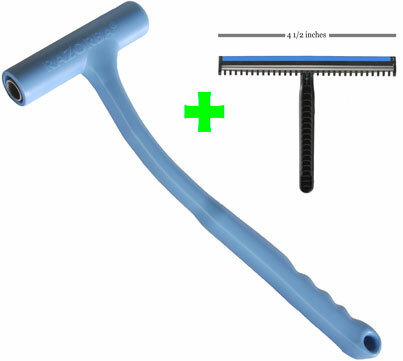 The Razorba [Ray Zore (sounds like Ore) Buh] is the convenient, do-it-yourself, painless, embarrassment-free, solution to back hair. 100% guaranteed! The Razorba is the patented Back Hair Shaver™ that holds a Razorba G.O.A.T. razor (extra wide and super comfortable) or your favorite razor, ergonomically designed and tested by men with back hair. It solves the problem of back hair removal by letting you shave at your convenience, any time you need to. It works with Razorba G.O.A.T disposables and most standard razors. It's quick and easy to insert or remove a razor. To use, simply insert a razor into the Razorba, apply shaving cream and shave. The Razorba really works. Learn why the Razorba is the best choice for back hair removal. And why it's better than laser hair removal, back waxing, and hair removal creams in the FAQ section. Makes a great & unique gift! Click on above images to learn more. Click here to learn more about Razorba shavers.